The graffiti visible behind this wonderful cast iron twin lamp rarity read "Solstice", and it was indeed the winter solstice for this sadly doomed dinosaur. We're at the western terminus of Canal Street in Lower Manhattan, summer of 1982. This twin lamp lamppost was of the latter generation of such cast iron poles, hailing from the 1920s, maybe 1930s or thereabouts. Unlike most of its still surviving contemporaries, however, it had design elements harkening back to the original 1890s vintage poles, like the bulbous ball decoration in the middle between the mast arms. It's finials and tall spike cap were also in what appeared to be perfect condition, and those were among the first decorations to disappear on most other such poles. 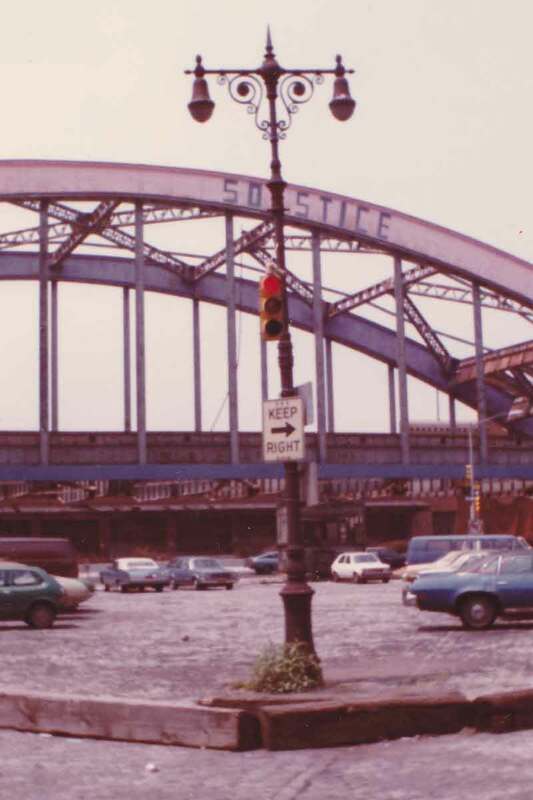 The viaduct behind the pole had once carried the West Side Highway over Canal Street, had been abandoned nine years when I shot this in 1982. It was ripped down not long afterward, and this magnificent lamppost went down with it, carted off to who knows where, even as retro replicas of its genre were popping up here and there at the dawn of the retro lamppost craze. How, or why the rusting abandoned viaduct seemed to sport a weird blue and pink paint job was, and remains beyond me. I'll leave that mystery to whatever weird-edifice-paint-job mavens might exist somewhere on earth. I'll stick to basic lampposts and roadway minutiae. How, or why some lunatic scaled that viaduct to spell out "Solstice" I'll leave to lunatic-graffiti-artists maven to expound on.